A discussion of American architecture cannot be complete until Frank Lloyd Wright enters the conversation. One of the most prolific and renowned architects of the 20th century, he was a radical designer and intellectual who embraced new technologies and materials. Largely focusing on organic architecture, he believed that structures should be in harmony with humanity and the environment. His most famous structure that follows this philosophy is Fallingwater in Pennsylvania built in 1935. A leader of the Prairie School movement and the developer of the Usonian home in Broadacre City, it was not uncommon for Wright to design parts or all of the interior of his buildings as well, as gesamtkunstwerk, or total work of art. The Usonian stool seen here was likely designed by Wright in 1949 for the Robert Winn house in Kalamazoo, Michigan. Usonia, Wright’s vision for the United States, revolved around city planning and building architecture. The homes he designed were small, centered on a small garden, and located on rather unusual and inexpensive sites. The Robert Winn house was one of four homes that were built for Usonia, the last of the four homes to be built and the only one two-stories tall. The name Usonia originated from Samuel Butler’s novel Erewhon: or, Over the Range, published in 1872, a satire of Victorian society. Much like the utopian society in the novel, Wright’s Usonia exhibited low-cost utilitarian homes and furnishings that would promote a democratic and cooperative way of life. The aim of the Usonian home was to provide an inexpensive residence that would encourage an informal style of domestic life, reflected in the simple forms and components of the interiors and the furniture. 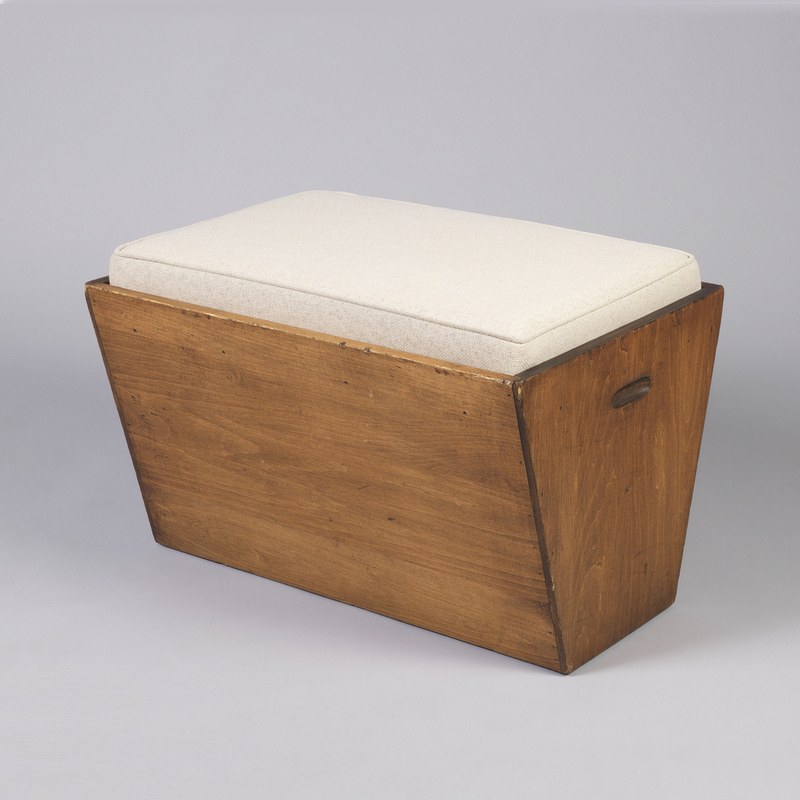 Local carpenters and craftsmen were intended to fabricate the furniture, and sheet-wood construction and simple upholstery were intended to make this cost-effective and simple yet powerful design. With these factors, the Usonian stool seamlessly fits into Wright’s overall democratic design. While Wright’s Broadacre City was never fully realized, his Usonian homes continue to exist in various capacities across the United States.